What does well-being have to do with the economy have to do with the creative industries? For the purposes of this entry, let’s use Gallup’s well-being that measures life evaluation, emotional health, physical health, healthy behavior, work environment and basic access (definitions of each here); GDP for the economy; and the creative class for the creative industries. Thanks to the Gallup-Healthways Well-Being Index, cities are now measured for happiness, with the San Jose, Washington DC, Raleigh Minneapolis, and San Francisco metropolitan areas taking the top 5 (see top 10, bottom 10 hhere). 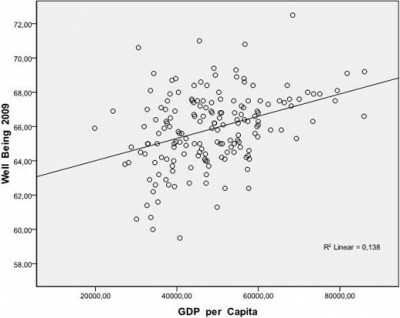 The Creative Class Group led by Richard Florida then produced a series of graphs linking that index to GDP, illustrating a positive correlation between well-being and GDP. Income and wage level had even higher correlations to well-being, respectively. Richard’s team also charted the creative industries with well-being (see graph below), showing a positive correlation between well-being and the creative industries as well. Thus further validates the link between creative industries and the economy from previous studies. The highest positive correlation was between well-being and human capital (measured by Richard’s team as higher education, or those with a B.A. and above). Another more unsettling finding was a negative correlation (-.34) between well-being and the working class. However this is more of a reflection in income disparity in a U.S. economy that is shifting from an industrial to an information/knowledge/creative economy, since studies show the working class in other countries having much higher levels of happiness. It’s not that the working class is not important, but that they’re not happy. This is precisely why cities like Detroit are investing in programs like its New Economy Initiative to improve workforce training in emerging industries… though their website is dead at the moment. Change is hard. This is in the Cooltown Top 20.